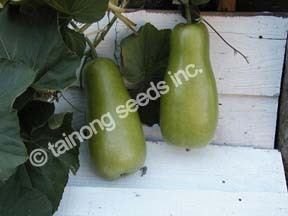 Bottle Gourd (Opo)瓠瓜 | Tainong Seeds Inc. Bottle gourd, opo squash or long melon is a vine grown for its fruit, which can either be harvested young and used as a vegetable, or harvested mature, dried, and used as a bottle, utensil, or pipe. For this reason, the calabash is widely known as the bottle gourd. The fresh fruit has a light green smooth skin and a white flesh. 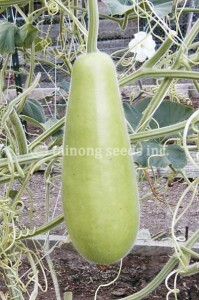 Rounder varieties are called calabash gourds. They come in a variety of shapes, they can be huge and rounded, or small and bottle shaped, or slim and more than a meter long. Vigorous grower and very productive. Dark to medium green fruits. Heavy fruits are about ~12 inches long and ~5 inches in diameter. Long fruits with smooth light green skins. Length is approximately 12~15 inches.